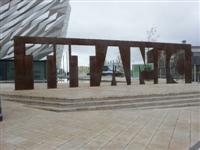 The Titanic Belfast visitor attraction extends over nine galleries, with multiple dimensions to the exhibition. Drawing together special effects, dark rides, full-scale reconstructions and innovative interactive features you will explore the Titanic story in a fresh and insightful way from her conception in Belfast in the early 1900s, through her construction and launch, to her infamous maiden voyage and catastrophic demise. 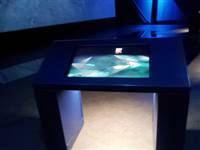 The journey goes beyond the aftermath of the sinking, to the discovery of the wreck and continues into the present day in the Ocean Exploration Centre. 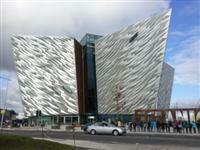 Tickets and Information, Titanic Store, The Galley and Bistro 401. 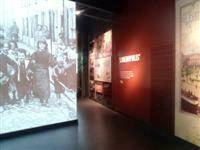 Titanic Belfast Experience and Toilets. The Andrews Gallery, The Education Suite and The Ocean Exploration Centre. The Titanic, Olympic and Britannic Suites. You are on Opening Times (April-September). Skip to the next section. The Titanic, Olympic, Britannic and Bridge suites are available for bookings and events. Please contact the venue for more information..
You are on Opening Times (October-March). Skip to the next section. There are 6 designated spaces on floor -1. There are 4 designated spaces on floor -2. 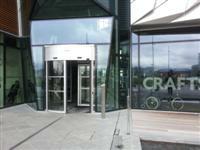 The lift is located next to the car parking. The floors which are accessible by this lift are -2 -1 0. The dimensions of the lift are 150cm x 180cm (4ft 11in x 5ft 11in). This information is for the entrance located at the east side of the building. This information is for the entrance located on the north side of the building. The door opening is 195cm (6ft 5in) wide. 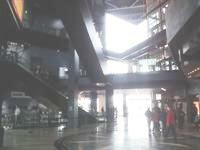 The main doors open by revolving. The doors are automatic and slow moving. You are on Reception (Ticket Desk). Skip to the next section. 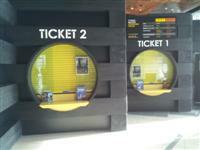 There are four ticket desks available. They all have lowered sections and they are all fitted with a hearing loop. 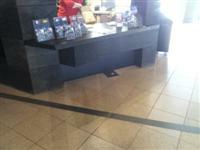 You are on Reception (Visitor Services). Skip to the next section. Music is played in some exhibitions. 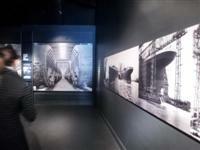 There is an easy ramp leading from the Boomtown Gallery to the Arrol Gantry Lift. 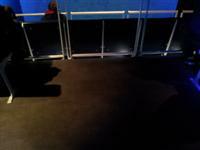 There is a moderate ramp leading into the Ocean Exploration Centre. You are on Shipyard Ride. Skip to the next section. Due to dimensional and weight restrictions on the Shipyard Dark Ride, mobility scooters unfortunately cannot be accommodated. There is a wheelchair accessible car which can accommodate one standard wheelchair at a time. Wheelchairs cannot be larger than 1m in length. Assistance dogs are welcome on the ship yard ride at the discretion of the owners. 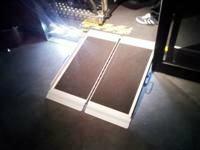 There is a 75cm moderate portable ramp to access the Shipyard ride. You are on Theatre (Discovery Theatre). Skip to the next section. Designated seating is located at the back and the floor below. Companions sit next to the you. You are on Restaurant Bar Internal (The Galley). Skip to the next section. 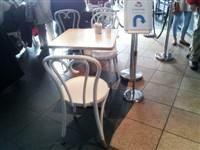 The nearest table is 8m (8yd 2ft) from the main entrance. 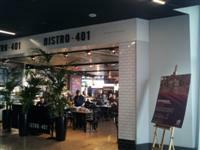 You are on Restaurant Bar Internal (Bistro 401). Skip to the next section. There are a variety of steps and escalators used to access the museum from G-1-2-3-4-5-6. 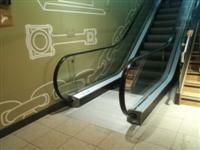 The stairs are medium and clearly marked with handrails on both sides. There are landings on some of the staircases. 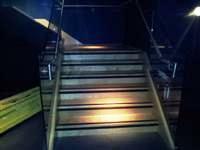 The lighting levels at the stairs varies depending on the area of the building. You are on Lift (Scenic). Skip to the next section. The lift is located at the side of the foyer. The floors which are accessible by this lift are G-1-2-5-6. The dimensions of the lift are 160cm x 195cm (5ft 3in x 6ft 5in). You are on Lift (Arrol Gantry). Skip to the next section. The lift is located at the end of the exhibition on the first floor. 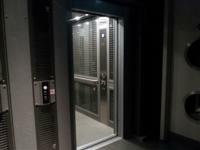 The floors which are accessible by this lift are 1-4. The dimensions of the lift are 110cm x 200cm (3ft 7in x 6ft 7in). This lifts gives access to the next part of the museum on the fourth floor. 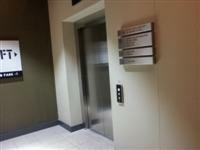 There is a similar lift next to this one. You are on Lift (Fourth Floor - Third Floor). Skip to the next section. The lift is located next to gallery 6 on the fourth floor. 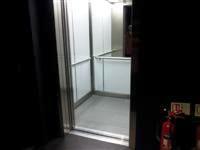 The floors which are accessible by this lift are 3-4. 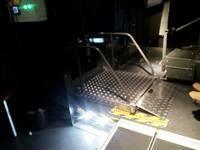 The dimensions of the lift are 140cm x 160cm (4ft 7in x 5ft 3in). 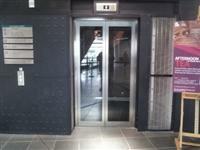 There is a similar lift in the Discovery Theatre which gives access down to the third, second and first floors. You are on Accessible Toilet (Parking - Floor -1). Skip to the next section. This accessible toilet is approximately 10m (10yd 2ft) from the car park lift. This accessible toilet is located next to the parking. The dimensions of the accessible toilet are 210cm x 290cm (6ft 11in x 9ft 6in). 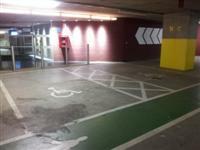 There is a similar accessible toilet on parking level -1 with dimension 155cm x 255cm. The accessible toilet is located next to Galley Cafe. 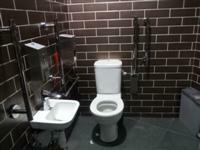 The dimensions of the accessible toilet are 180cm x 230cm (5ft 11in x 7ft 7in). 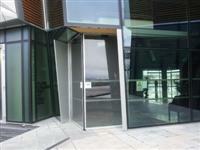 The accessible toilet is 25m (27yd) from the scenic lift. The accessible toilet is located on the landing before the entrance to the first gallery. You are on Accessible Toilet (First Floor - Gallery 1 - Boomtown ). Skip to the next section. 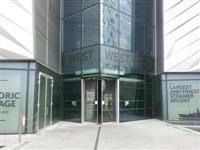 The accessible toilet is 1m (3ft 3in) from the Gallery 1. 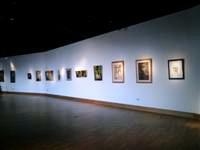 The accessible toilet is located on the first floor in the Boomtown Gallery. The dimensions of the accessible toilet are 150cm x 300cm (4ft 11in x 9ft 10in). You are on Accessible Toilet (Fourth Floor - Gallery 6). Skip to the next section. This accessible toilet is approximately 2m (2yd 7in) from the gallery 6. This accessible toilet is located next to gallery 6. The dimensions of the accessible toilet are 180cm x 245cm (5ft 11in x 8ft). The height of the baby change table once extended is 95cm (2ft 11in). You are on Accessible Toilet (Third Floor - Gallery 8). Skip to the next section. 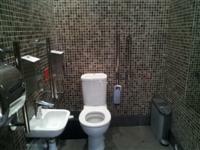 This accessible toilet is approximately 20m (21yd 2ft) from the Fourth Floor - Third Floor Lift. This accessible toilet is located on the third floor next to Gallery 8. There is a similar accessible toilet on the fourth floor next to the shipyard ride, which is 150x205cm and with the lateral transfer space on the left. There is a similar accessible toilet on the second floor next to Andrews Gallery, which is 150x210cm and with the lateral transfer space on the right. The accessible toilet is 2m (6ft 7in) from the scenic lift. The accessible toilet is located next to the scenic lift. The dimensions of the accessible toilet are 148cm x 235cm (4ft 10in x 7ft 9in). You are on Accessible Toilet (Fifth Floor - Titanic and Olympic Suite). Skip to the next section. 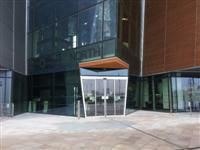 The accessible toilet is 14m (15yd) from the scenic lift. 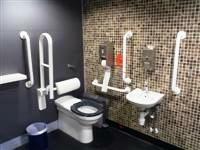 The accessible toilet is located next to the Titanic and Olympic Suite. The dimensions of the accessible toilet are 195cm x 250cm (6ft 5in x 8ft 2in). The female and male toilets are located throughout the building. Baby change facilities are located in the first floor baby changing room. 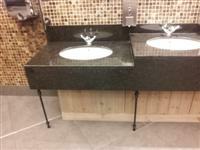 Some of the standard toilets have grab rails and lowered sinks. Mobility scooters are available provided by Belfast Shopmobility.